One of these strategies is the use of insects, as for example grasshoppers, in the animal feed and human food. Today 1 million kinds of insects are known world-wide and one estimates the real number to 80 million. Approximately 1400 kinds are classified as edible. In comparison to conventional stock animals (beef, pork, chicken), the insect protein content is generally similar with a high content of es-sential amino acid. Moreover, they contain more polyunsaturated fatty acids and have a higher content of minerals. (Rumpold & Schlüter, 2013). Advantages are lower emission of greenhouse gases, requirement of less land space in com-parrison to conventional livestock and the high feed conversion efficiency. Grasshoppers are highly sensitive to environmental influences. This is the reason why grasshopper breeding is very expensive. Hence, the costs for staff are higher within the industrial “production” (breeding, harvest, processing) compared to other meat. By an installation of automation steps the breeding can become more economically and efficient with constant guarantee of the food and feed security. The task of the PPM was to isolate and fractionate proteins from grasshoppers, as well as to check their usability. 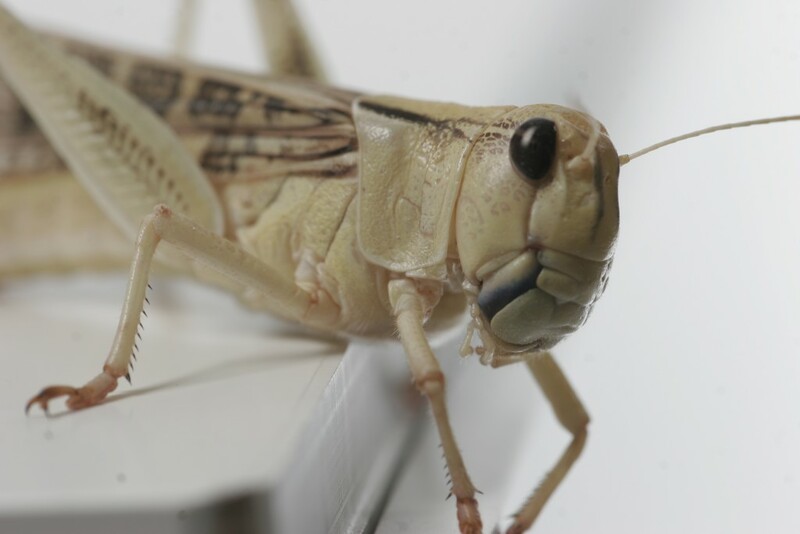 In addition, the nutritional benefit and functional properties of grasshopper proteins should be investigated more closely, as well as their potential as a feed or food additive. Further, the grasshopper by-products, e.g. Chitin and fats were investigated. A method has been developed to isolate proteins from the whole grasshopper. The grasshopper proteins obtained contained all essential amino acids except valine. However, with this method, only a protein yield of about 10% could be achieved. The grasshopper proteins showed good foam capacity and stability, while the water and fat binding capacity was low. Furthermore, the they showed no film-forming ability. The chitin content of the grasshoppers was 30 – 40% (dm). On the other hand, the residual oil content was 25-30% (dm), the highest oil content in the abdomen being detected with about 52%. The fatty acid spectrum of the grasshopper oil is very similar to palm oil. The levels of palmitic acid and oleic acid were lower whereby the contents in linoleic acid and alpha-linolenic acid were higher. Rumpold, B., & Schlüter, O. (2013). Potential and Challenges of Insects as an innovative Source for Foodand Feed Production. Innovative Food Science and Energing Technologies 17, 1-11.
van Huis, A., Dicke, M., & van Loon, J. (2015). Insects to feed the World. Journal of Insects as Food and Feed 1 (1), 3-5.